Hello friends! Today I’m going to show you a simple method for making scrappy Christmas stockings. They’re quick and super easy (I promise) and a great way to use up your favorite fabrics or scraps. Using fat quarters, mine finished at 17″ x 6″. You could enlarge the pattern and make the stockings any size you like, using the same method. I used a bunch of gorgeous Art Gallery Fabrics from various collections including their Oval Elements, Pure Elements, Indie and Rhapsodia. Stocking template here (part 1) and here (part 2). Cut out pattern and trace two lining pieces (facing opposite directions) from one fat quarter. Gather 15-18 fabric strips at least 8″-9″ long and various widths. Trim batting scrap to slightly larger than the stocking pattern. 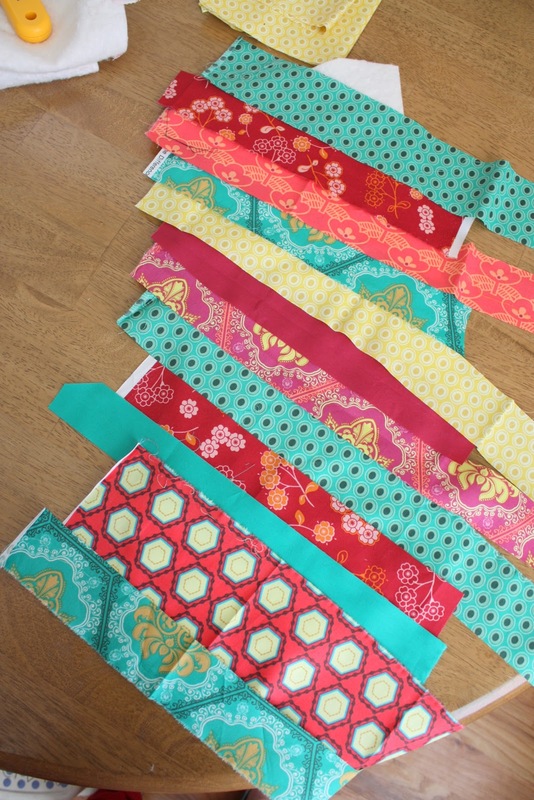 “Audition” fabric strips in the order you like before you start sewing. Remove strips except middle two strips, but keep them in the planned order. Place middle strip in place on the batting and pin adjacent strip right sides together. Sew strips together (and to batting) using 1/4″ seam allowance. If you have a walking foot, I suggest using it. Press strips open. Lay stocking pattern over quilted piece and cut stocking front trimming off 1″ at the top. Cut a backing piece facing the opposite direction from the front also minus 1″ from the top. You will now have a front, back and two lining pieces. Match up the pieced front with a lining right sides together (toes pointing the same direction) and a back and lining piece right sides together. 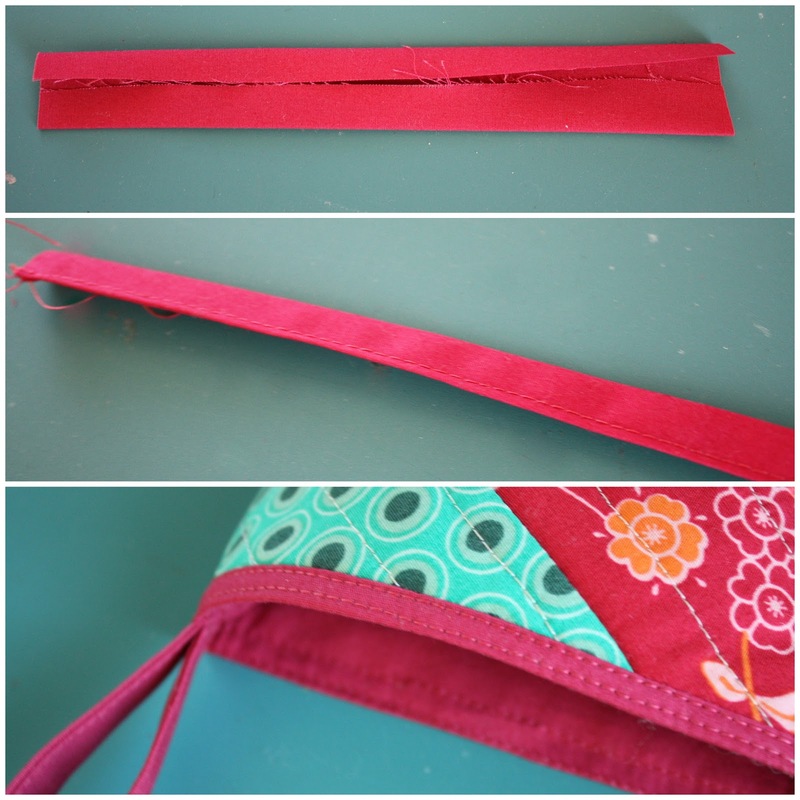 Sew top edges together using 1/4″ seam allowance. Press seams open. Match up two new pieces with lining pieces right sides together and front/back right sides together. Sew all the way around matched pieces using a 1/4″ seam allowance and leaving a 4″ opening in the lining. Before turning right sides out, trim fabric close to seam allowance on the lining pieces and clip curves of the outside portion of the stocking. Turn right side out and topstitch lining gap closed. Tuck stocking lining inside the stocking, leaving the top of the lining sticking up 1/4″ to create contrasting trim. Carefully shape and press the stocking, esp the top edge (see below). To create a hanging loop, cut a scrap 1.5″ x 6″. Fold in half and crease. Open and fold sides into the crease. Press. Fold in half again and top stitch open sides closed. 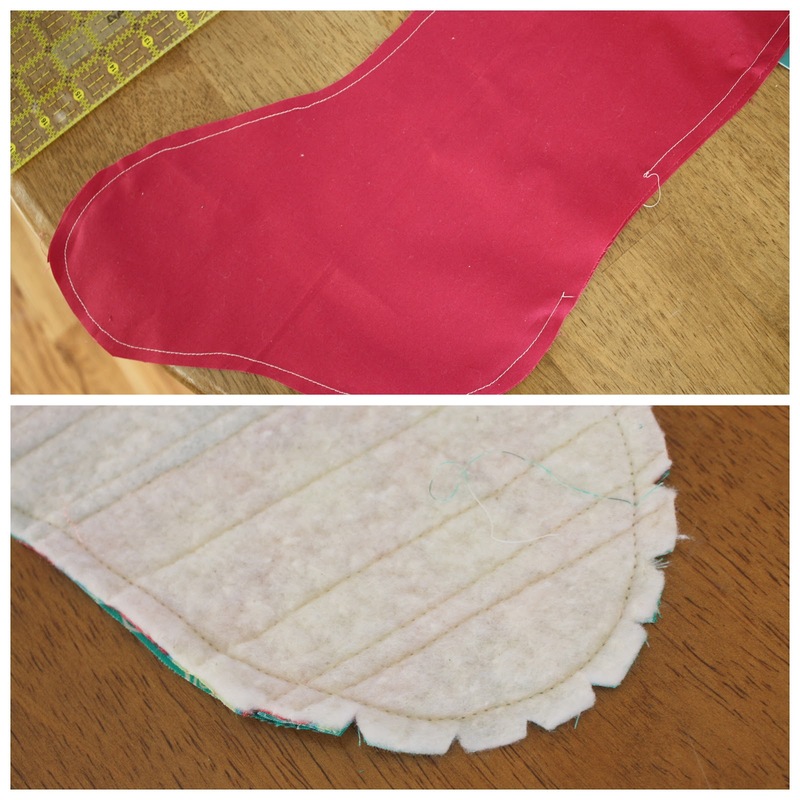 Fold loop in half and pin to the inside of the back seam of the stocking. Sew it in place at the same time you top-stitch the top edge of the stocking. I top stitch at the top and bottom of the ‘trim’ to give it a finished look. And that’s it! You’re done. You could even do the same pattern and just make ‘solid’ fronts for your stockings. This tutorial was originally on Art Gallery Fabrics blog as part of the series of tutorials from the Fat Quarter Gang. I follow Art Gsllery Fabrics blog, and also on Facebook. I loved the stocking tutorial! Amy, cute stocking! I might have to make one or ten. <br />I follow the AGF on their blog and by facebook. <br />Thanks for the chance to win. I subscribe to their blog. Thanks for the tutorial and giveaway. My favorite way to follow AGT is through my google Reader. I subscribe through Google reader. Thanks! I follow everything in Google Reader. It&#39;s embarrassing how long my list is in there! I like keeping up on facebook best, but also use many of the other options too. Thanks for a great tutorial! 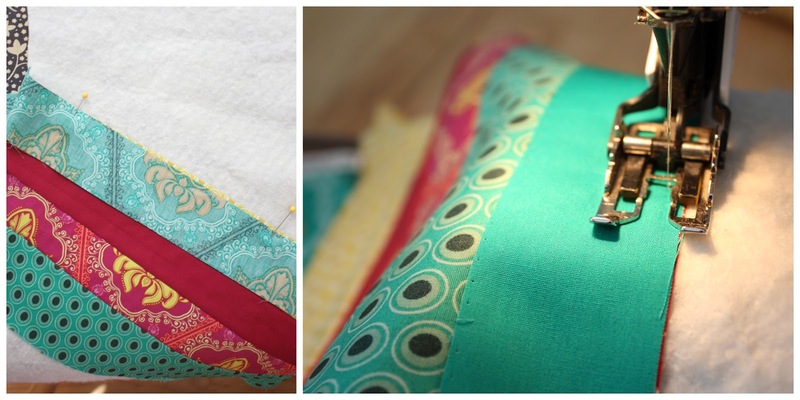 It&#39;s perfect for the sewing project at Hopeful Threads this month! Cute stockings!!! I love non-traditional colors for Christmas.<br />I subscribe to the AGF blog and follow them on Twitter. Thanks for the stocking tutorial and the chance to win. Very cute! I follow their blog through google reader! Thanks for the chance to win! I follow AGF on Twitter. <br />P.S. I love the stockings! I like the contrasting trim! Thanks — this looks like a quick and pretty project. I subscribe to Art Gallery Fabrics via google reader. I follow you and them thru Google Reader. Thanks for the chance and the tute! Great stocking tutorial! My favourite way to follow is with bloglovin&#39;, but I follow with twitter, facebook &amp; google too. Bloglovin&#39; just makes it so easy. Thanks for the chance to win. Love these stockings! I follow the AFG blog. What gorgeous fabric! I follow them on Facebook. I&#39;m certainly going to make some Christmas stockings and follow them on Facebook. I follow Art Gallery Fabrics on Facebook :-)<br />wowie what a lovely color range is that bundle!!! I follow their blog through Google reader. I love following the AGF blog – thanks for the great tutorial! I follow AGF blog on Google reader. I&#39;ve been looking for a pattern like this since having 2 more grand babies–thanks! I follow you through google reader and FB. I saw these over at Art Gallery. They are so adorable!! I just love them!! What a beautiful range of colours. I follow through pinterest and am a regular blog reader. I&#39;m following on Facebook. I really need to make some stockings! I follow their blog. Those are awesome stockings and beautiful fabric. Thanks for the chance. Follow AFG on Facebook (easiest)!! Beautiful color combo for the Fat Quarter Bundle!!! I Subscribe to their newsletter.Thanks for the chance! I follow AGF everywhere. A bit of a social media stalker. I get a good laugh out of their videos they post on You tube. Love your little stocking and the palette of colours you chose. I follow on Facebook. I don&#39;t have twitter, and I refuse to get sucked in to Pinterest…I spend way too much time online as it is! I follow Art Gallery on Facebook, their blog &amp; get their newsletter. I follow AGF on facebook. 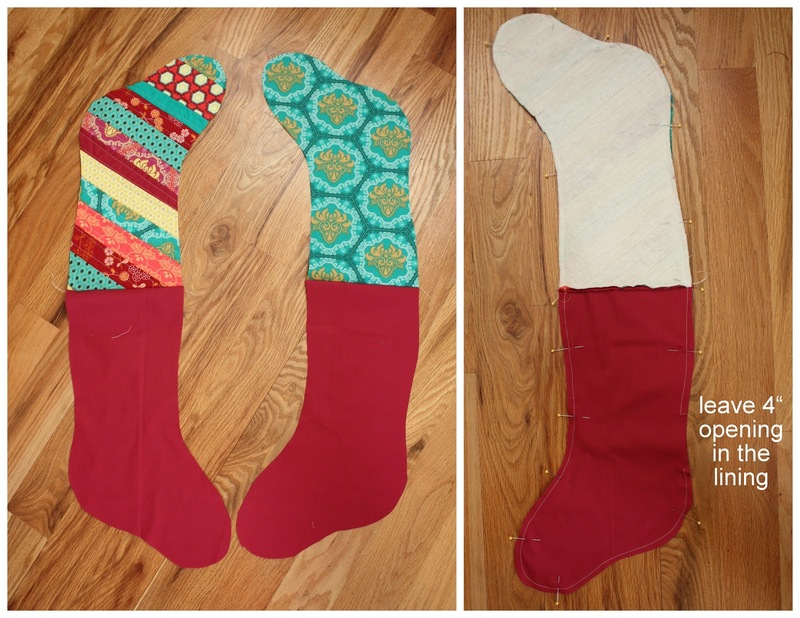 Love the fabric and the stocking tutorial! I was just cutting some pieces for some christmas stockings last night. Hi!!! Your stockings are very pretty!!!! I love the fabric!!! I subscribe AGF!!! Thanks for the fun!!!! I love your stockings… especially because they are in non-traditional colour scheme!! I think that I need to update some stockings in our home and will follow your tute… thanks!! I follow their blog and of course many of their FQ Gang! Great tutorial! Those sticking are fabulous. Thanks! I follow Art Gallery on Facebook. Thanks for the tutorial, I want to make new stockings for everybody this year. I love the fabrics you used. I follow Art Gallery fabrics on FB. Love this tutorial, thanks! I follow AG on FB….great stockings, we love our stockings around here. I follow Art Gallery&#39;s blog. Lovin&#39; those scrappy stockings. Thanks for the tutorial. These stockings look good and reasonably easy. Cute! Thanks for the tutorial amd the giveaway! I subscribe via email. I follow through Google Reader. I also follow via FB. I follow AGF on Pinterest, liked on FB, and subscribe to blog. Thanks for the great tutorial for stockings. Very pretty. I follow the AGF blog. 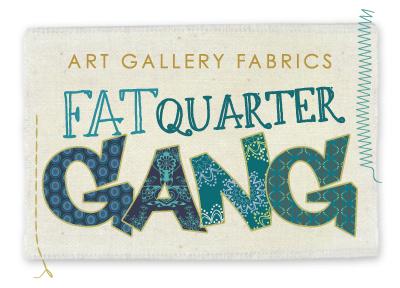 I love all their projects from the Fat Quarter Gang! i follow agf along on fb, their blog by email. that&#39;s a nice, easy and fast stocking pattern. thanx for the chance to win a fantastic bundle to make it with. I follow the AGF blog – receiving posts by email. Love the stocking tutorial. Thanks for the chance to win. I am really liking the introduction of aqua as a Christmas color. I have a pattern with presents and some fat quarters in red, aqua and green that I am itching to stitch up into a large lap size quilt. These stockings may be just the ticket to do a smaller project and still slake my color combo thirst! I follow on Pinterest, facebook, and by email! I love all the great projects! I am going to make stockings! I follow them everywhere, but I love their blog as a way of seeing different uses for the fabric! 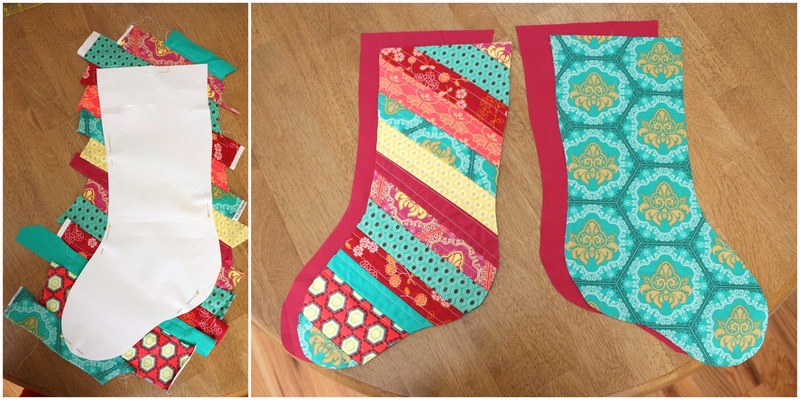 I so enjoy making Christmas stockings and I really like the Oval Elements – they are so great to have in my stash! I follow AGF on Facebook (jdgunthorpe at yahoo dot co dot uk) and receive their blog updates via email. Love their fabric! Your stockings are gorgeous! Thanks for the tutorial. I follow Art Gallery fabrics on Twitter &amp; via email subscription, thanks! I follow on facebook and email. Love the stocking colors do non traditional. I follow on email. Love your Christmas stockings! I follow on Facebook. Thanks so much for this tutorial! I am SO doing this for my children – today! I live in Germany and they don&#39;t have the whole stocking thing at Christmas – so only my hubby and myself have stockings! My little ones MUST have some of these! I&#39;m smitten! Thanks also for the giveaway! Those are adorable Amy. You always come up with such fun fabric combinations! I discover AGF today with your blog, thank you for this and the funny tutorial! I Love those fabrics. Just found them on Facebook and am now a follower. Wonderful tutorial. I follow both you and Art Gallery. I follow them in Google Reader. Beautiful fabrics! Thanks for the tutorial. I follow AGF on Facebook and Pinterest. I love the stocking tutorial!! I had a brand new great niece born yesterday and I&#39;m definitely using this to make her a cute stocking for Christmas! I folow on facebook. Great tutorial! I subscribe to their blog by email. Love the stockings! My favorite way to follow AGF is on Pinterest – love the inspiring ideas. I love AGF. I follow them on Pinterest, the blog and FB. Thank you for the cute tute! I love &amp; follow their pinterest boards. I like them on Facebook! Thanks for the chance to win! I Lke them on Facebook and I subscribe to their blog. That&#39;s how I found you. So cute. My favorite way to follow is my subscription. I love your color palette. It&#39;s like citrus Christmas. My favorite way to follow AGF is via Pinterest. Thanks! I follow on Pintrest! Great stockings! Those stockings look great! Facebook for me. <br />Needed that easy stocking project for 11 grandchildren! I follow on pinterest. Hi their : )<br />What a great idea! Love the stockings to bits!<br />Thanks for sharing! I follow AGF on Twitter, easy! Love the stockings!!! I love follow AGF on FB. thanks so much for the pattern. And thanks for letting us see your whole post in Google Reader! Since I don&#39;t Facebook, Twitter, Instagram or Pinterest, it&#39;s great that I can follow AGF with RSS Owl. Thanks for the chance to win! And I love your stocking tutorial. How did you know I need to make three stockings before Christmas?! Catching the blog on Google Reader works best for me. Nice stocking pattern! I follow AGF on Pinterest. It&#39;s easy to save patterns and ideas. Thanks for the tutorial! I follow AGF on FB and their blog. My favorite is FB. I follow AGF on their blog and on FB. Thank you for the giveaway! I follow AGF on facebook. Love this fabric! I follow them on pinterest. What a lovely collection of fabrics! I&#39;ve never purchased any Art Gallery fabrics, but I admire them constantly. 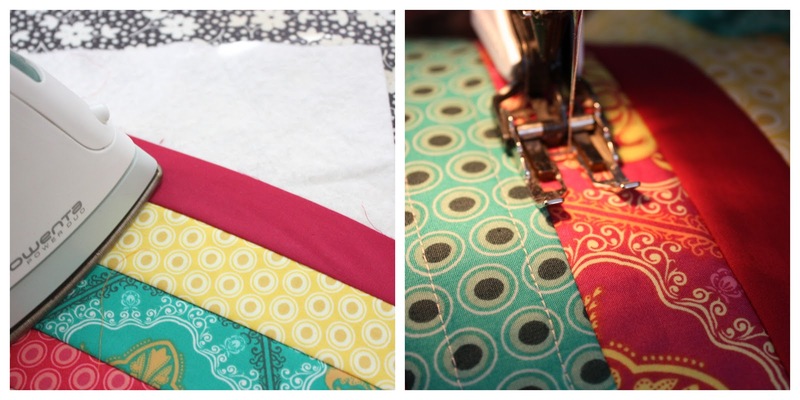 Right now I&#39;m not allowed to buy fabric until Jan so winning this bundle would be fantastic! I&#39;m not entering the competition, but just wanted to say what a lovely day me, my sister and my 5 month old niece have had making this Christmas stocking. Feeling so happy and festive. Ho Ho Ho! Thanks for the giveaway. I follow AGF on FB and blog. I follow AGF on facebook. They have such fun post. I follow AGF on Pinterest. Thanks! I&#39;m following on Pinterest! Cute stocking. Want to give these a try for next years gifts.